The Royal Site of San Lorenzo de El Escorial, commonly known as El Escorial, is a historical residence of the King of Spain about 45 kilometers (28 miles) northwest of the capital, Madrid. It is one of the Spanish royal sites and functions as a monastery, royal palace, museum, and school. 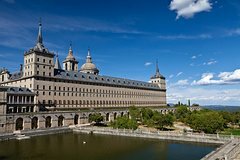 The Escorial comprises two architectural complexes of great historical and cultural significance: the royal monastery itself and a royal hunting lodge and monastic retreat about five kilometers away. El Escorial was, at once, a monastery and a Spanish royal palace. Originally a property of the Hieronymus monks, it is now a monastery of the Order of Saint Augustine. In 1984 UNESCO declared The Royal Seat of San Lorenzo of El Escorial a World Heritage Site. It is a popular tourist attraction, often visited by day-trippers from Madrid. The visit include the Monastery, the Cloister of the Four Evangelists, the Palace of Philip II, Pantheons of the Royal Family, the Chapter houses, and the Basilica. Segway tour starts at 10 Escalinata St. Your guide will take you there walking from the meeting point.